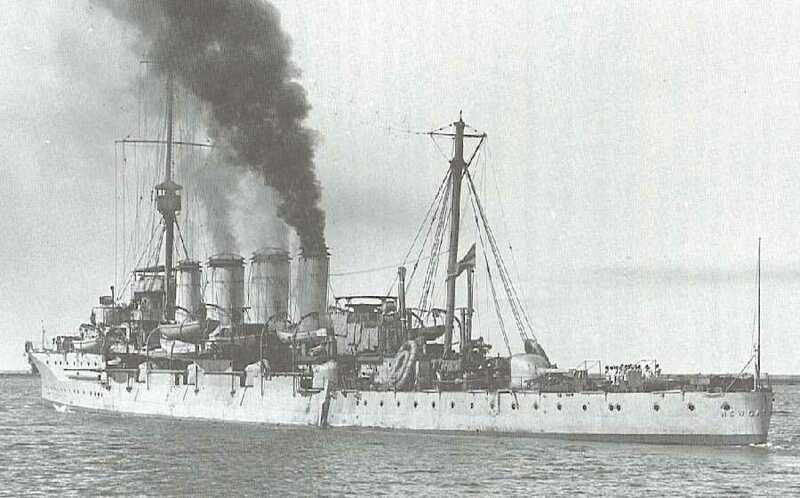 HMS Newcastle in 1918 showing stern and broadside 6" (15.2 cm) guns. IWM Photograph. Introduced on HMS Black Prince in 1906 and subsequently used as secondary guns on many pre-dreadnoughts. These were the first 6" (15.2 cm) guns of 50 calibers to be mounted on a European ship. These guns were found to be too heavy to aim manually, especially on the smaller cruisers. For that reason, hydraulic power gear was added to some mounts in the latter part of World War I. During World War II, these guns were used on auxiliary warships, armed liners, DEMS and Ocean Boarding Vessels. They were also extensively used in Australian coast defenses constructed prior to World War II. Constructed of a tapered inner A tube, A tube, wire, full length jacket, breech ring and breech bush screwing into the A tube. Mark XI* differed in having a thicker inner A tube and the use of cannelured rings at the two forward shoulders. A total of 177 were built, which were 34 Mark XI, 18 Mark XI*, 124 Mark XI* with a slightly different breech ring for PVI mountings and one "H" Mark XI* which was a Coventry ordnance gun with Holmstrom breech mechanism. This last gun was linered down to 3 inches (7.62 cm) and used for experimental purposes. Of the remainder, 126 remained in service as of 1939. 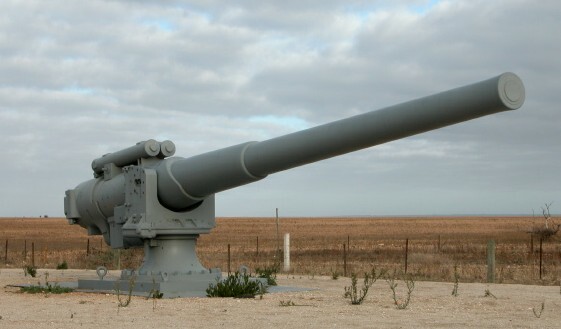 Twenty-six Mark XI guns were used in Australian coastal batteries prior to World War II and many others were used in emergency coastal defense batteries during the war. At least one Australian and two South African guns still survive, as can be seen on the additional pictures page. ^In "Jutland: An Analysis of the Fighting" by John Campbell, it is stated that almost all British capital ships had few or slow hoists for their 6" (15.2 cm) guns and that once the ready ammunition was used up, the rate of fire dropped to about 3 rounds per minute. For light cruisers the rate of supply was was about three to five rounds per minute per gun and usually closer to the lower figure. During the Falklands Battle of 1914, these 6" (15.2 cm) guns on HMS Glasgow were reported to have been badly outranged by the much smaller German 10.5 cm (4.1") guns on SMS Leipzig. However, the heavier British shells with their lyddite bursters were significantly more effective than the lighter German ones. Data from "The Grand Fleet: Warship Design and Development 1906-1922" for an angle of obliquity of 30 degrees and a striking velocity of 1,502 fps (458 mps). Projectiles were salt-filled (blind). Data from "The Grand Fleet: Warship Design and Development 1906-1922" for an angle of obliquity of 30 degrees and a striking velocity of 1,746 fps (532 mps). Projectiles were salt-filled (blind). ^1.11.2PV and PV* mountings were made by Elswick. ^PVI mountings were made by Coventry Ordnance Works. ^Marshal Ney was given guns from the scrapped HMS Hibernia. 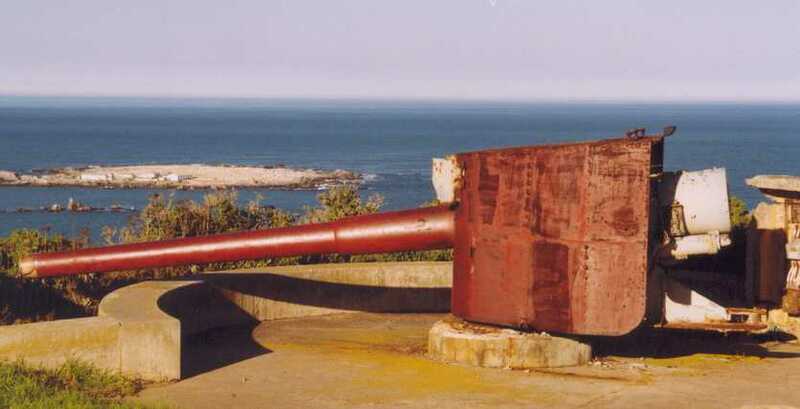 One of the two 6"/50 (15.2 cm) Mark XI guns at Malgaskop, South Africa, guarding the entrance to the greater Saldanha Bay. This appears to be a simpler mounting than those used for the shipboard guns. 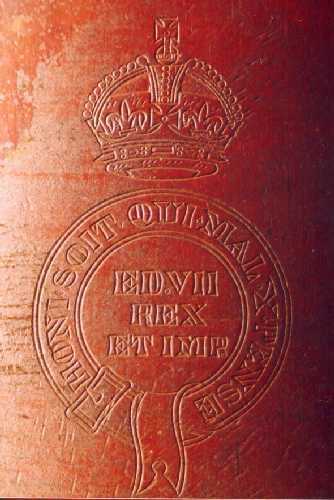 Photograph copyrighted by François Bernard Jarvel, Lecturing Assistant, SA Military Academy. 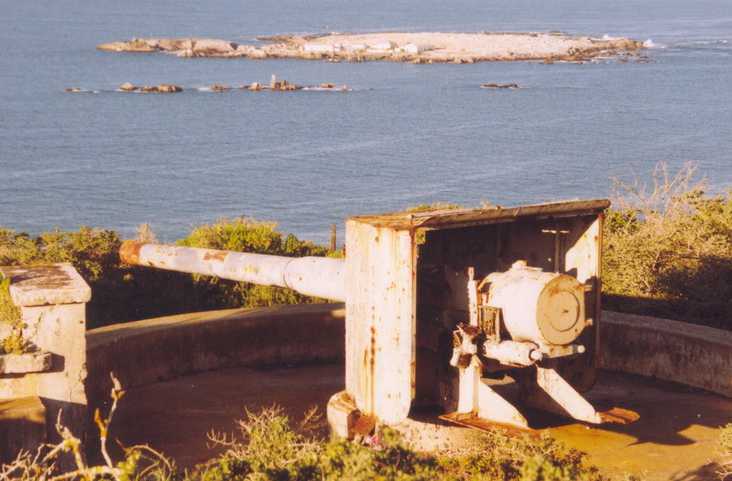 The second 6"/50 (15.2 cm) Mark XI gun at Malgaskop, South Africa. Note that the breech mechanisms have been removed from both of these weapons. Photograph copyrighted by François Bernard Jarvel, Lecturing Assistant, SA Military Academy. Breech of 6"/50 (15.2 cm) Mark XI gun at Malgaskop, South Africa. Photograph copyrighted by François Bernard Jarvel, Lecturing Assistant, SA Military Academy. Emblem on the first gun at Malgaskop, South Africa. Photograph copyrighted by François Bernard Jarvel, Lecturing Assistant, SA Military Academy. 6"/50 (15.2 cm) Mark XI now at the Port Wakefield Proof Range, about 60 miles (100 km) north of Adelaide, Australia. Note that this gun has the recoil cylinders on top and that it uses a PV mounting. Photograph copyrighted by Peter Bell.